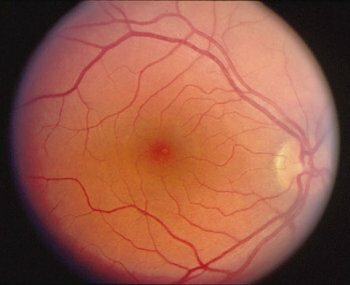 View of a human retina through an ophthalmoscope, showing fovea (darker red region at center) surrounded by macula lutea (yellowish region). Image credit: John Moran Eye Center, University of Utah. The fovea is a shallow pit in the retina of the eye of some vertebrates, which is the region of greatest acuity in vision. The fovea contains no rod cells but numerous cone cells. There are also no blood vessels or thick layer of nerve fibers interposed between the cones and the incoming light, as is the case in the rest of the retina. The fovea occurs in primates including humans, and in diurnal birds and lizards. Primates have a single fovea. Certain species of bird, such as hawks, are bifoviate, whereas dogs and cats, for example, have no fovea but a central band known as the visual streak. An area of relatively acute vision, called the macula, without a fovea, is found in many vertebrates. In humans and other primates, the fovea lies at the center of the macula lutea, which is an area containing yellow pigment. The primate fovea is about 2.5 mm in diameter and is slightly darker than the surrounding retina because of increased pigmentation. In binocular vision the two eyeballs are orientated so that the image of one object falls on the foveae (or maculae) of both retinas; this is the object "looked at", i.e., it plays the dominant role in the visual stimulation of the animal. Many vertebrates without binocular vision also similarly look at objects with the fovea or macula of one eye.